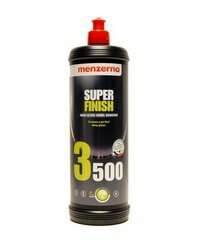 Representing the ultimate culmination of the development of Menzerna clear coat repair system, SuperFinish Plus 3500 is the industry standard for fine finishing polishing of scratch-resistant car body clearcoats. With its high powder concentration and improved liquid formulation, 2500 grit sanding marks can be removed on fresh scratch-resistant and conventional clears. Light scratches and hologram defects are removed faster, with less dusting and minimal polish residue. In reality this is the closest Menzerna do to a single step product. SuperFinish is Menzernas advanced solution for OEM assembly plant applications, body shops and detailing/reconditioning specialists. It can be used with either a rotary or random orbital polishing machine such as the Meguiars G220 or Kestrel DAS-6/PRO. If you are looking for a perfect, hologram and swirl-free finish on the darkest paint colours without any hiding or filling of defects, SuperFinishPlus is your first choice for permanent defect repair. "Thanks ever so much for a swift and professional response. I have ordered a charger and will be using you again! Well done "